In 1921 an informal match took place at Royal Liverpool G.C. between a team representing Great Britain and a touring party from the United States of America here to play in the Amateur Championship. William Fownes approached The R&A seeking their agreement to the contest. The R&A accepted the challenge and cancelled the Scotland v. England international match that had been due to be played, recommencing following the end of World War I. In 1922 George Walker, President of the USGA, sent out his invitation to the golfing world seeking to arrange a new international contest. 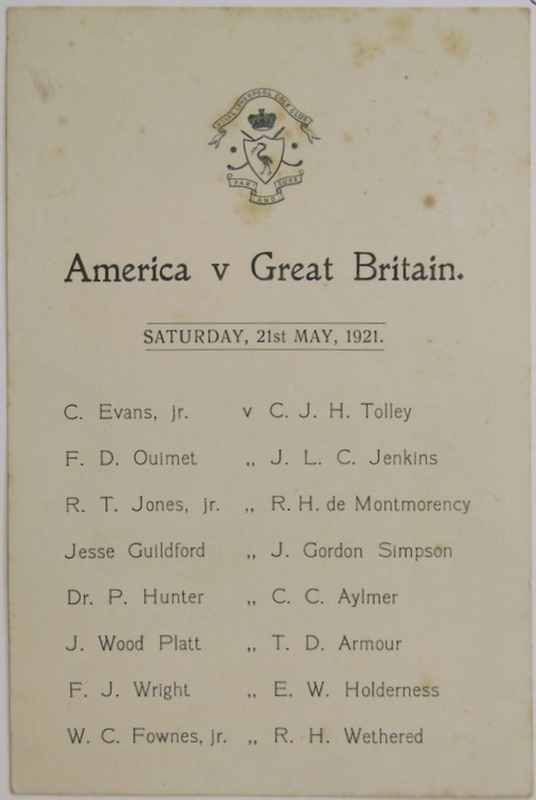 With little interest from other nations a match solely between USA and GB&I was agreed for 1922 and The Walker Cup story began in earnest. No one knows what part this first match at Royal Liverpool played in the thinking of George Walker but any history of the competition would be incomplete without its mention.